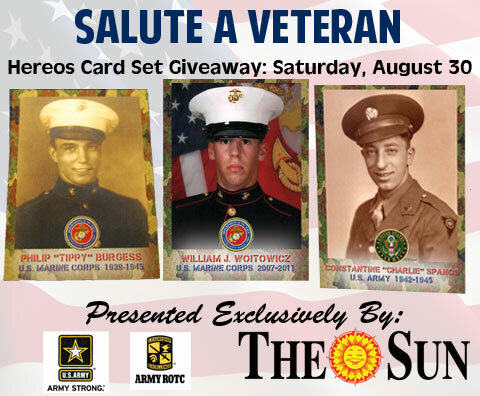 The Spinners have partnered with Army ROTC, the US Army and The Lowell Sun to salute our local heroes. Do you know an active duty or retired member of our armed forces? We want to salute them. We are looking for members of the Merrimack Valley community to salute this summer when we give the first 1,000 fans a "Local Heroes" card set as they enter the front gate Saturday, August 30 when the Spinners take on the Aberdeen Ironbirds. Last year's promotion was such a hit that it was awarded Minor League Baseball's "Golden Bobble Head" for "Best Promotion" and dozens of teams across the country have done similar sets to honor their service men and women. Join us in finding our second group of heroes by nominating a hero today!